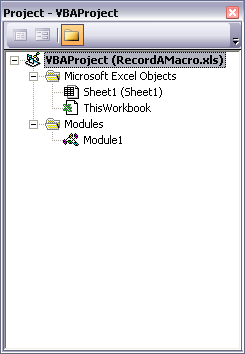 In a recent post, I showed how to copy someone else’s VBA procedure (i.e., “macro”) and paste it into your own workbook. Fortunately you don’t have to rely on others for custom macros. Excel includes a Macro Recorder which captures your actions, so that you can replay them later, saving yourself time and keystrokes. It’s easy to record and rerun macros. You can start the Macro Recorder in a number of ways. The Macro Recorder will now record all of your steps until you turn it off, using one of several methods. If your workbook had no macros to begin with, the Macro Recorder creates a new code module, which you can see in th Project Explorer Window. If the Project Explorer isn’t visible, go to View menu > Project Explorer. 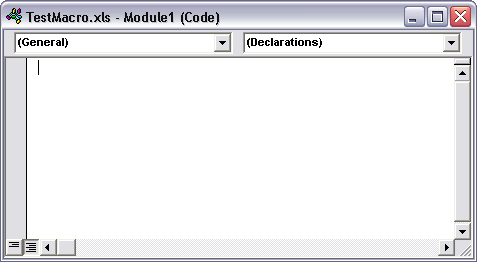 To view the macro you’ve recorded, double click on the new code module. Posted: Monday, March 10th, 2008 under VBA. 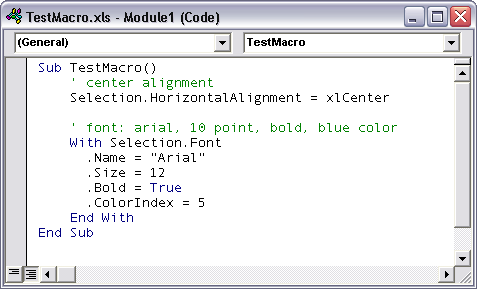 Tags: macro, recorded macro, VB Editor. Last night a colleague complained because there was no way to evaluate a formula in the worksheet. What he meant was, he wanted to enter “m X + b” (for example, with numerical entries in place of m and b) into a cell, then link to another cell that contained a value of X, and have Excel compute the formula. Formula – string representation of formula, or reference to cell containing string representation of formula, where Formula is the f(x) part of y=f(x), and x must be represented as [x] and all operators must be explicitly included within Formula. Xvalue – string or numeric representation of the value of x, or reference to single cell containing string or numeric representation of the value of x.
and this cell is copied and pasted into B2:E6. It looks good to me. Posted: Friday, March 7th, 2008 under VBA. 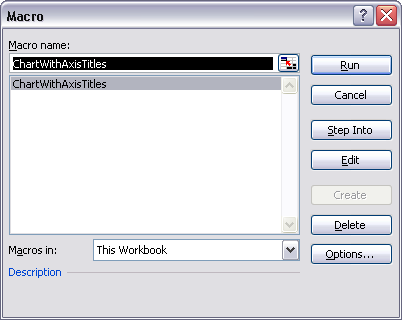 Tags: Statistics, user defined functions, VBA. 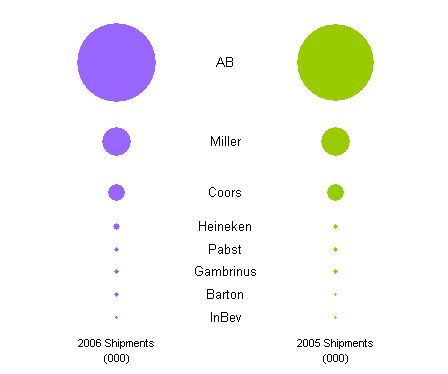 Last fall, Many Eyes posted a bubble chart to show US Beer Shipments by Supplier. They made the chart using a visualization technique they call the matrix chart, which essentially supplies a matrix of rows representing one parameter, columns representing another, and a graphic at each grid location representing some value. 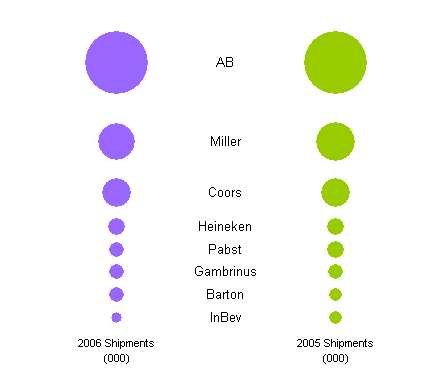 In this case, the columns represented year, the rows represented beer distributor, and the graphic was a circle with an area proportional to the sales volume for that distributor during that year. 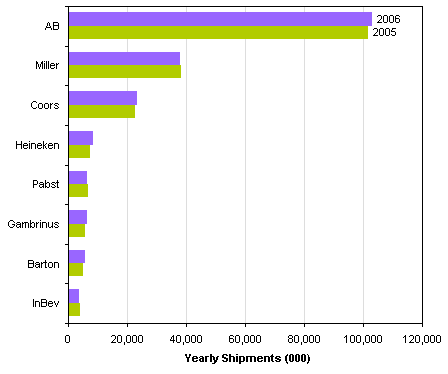 Presumably sales volume was in dollars, but given that Anheiser Busch was the leader, it may well have been in gallons. Based on bubble area, a bubble with 1% of the value of a large bubble will have 1% of the area or 10% of the width, so small values are still readily visible. Based on bubble width, the 1% bubble is 1% of the width of the large bubble, and as you can see (or can’t see), the smaller bubbles risk disappearing altogether. I think my version’s distributor labels are well placed between the columns of data, though I could easily enough have located them off to one side. The advantage of this chart type is that the values are based on the thickness of the bars, and cognitive scientists have demonstrated that human perception of one dimensional variables (i.e., length) is much more accurate than that of two dimensional variables (i.e., area). This is the rationale for not using pie charts, because humans are not very good at comparing the areas. The angular misalignment of wedges in the pie makes this comparison even worse. But I digress…. The problems with this chart involve the configuration of the bars. For even the largest values, the bar width is much wider then the thickness, so the thickness is not readily perceived. Bars for different years from the same distributor are difficult to compare because of the small heights of the bars and because of the distance between the bars (so perhaps the labels should be moved to the side and the bars moved together). Bars from different suppliers are even harder to compare because they do not share the same baseline, but are offset vertically. To make the values easier to compare, labels have been added showing the values themselves. The result is that the chart has been converted into a table with excess chart junk. All in all, I found this chart style lacking, no better than the bubble version. 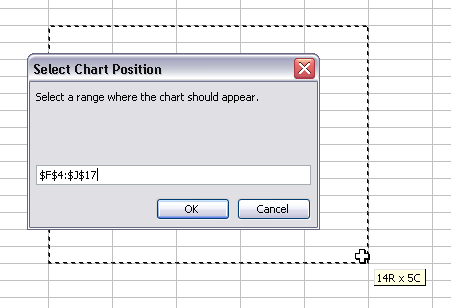 it is a standard chart style, built into most if not all plotting packages, even Excel. The chart type that shows this data best is a simple clustered bar chart. 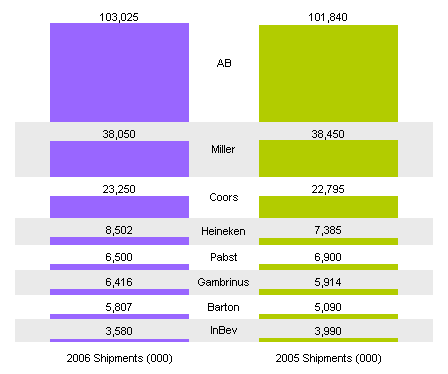 It is very easy to see small variations among the smaller distributors, and you can easily see which distributors saw increased vs. decreased sales in 2006. This simple chart is a good example of the KISS principle: Keep It Simple Stupid. (I once worked with a Total Quality instructor who was always coming up with more politically correct words for that second “S”, but none of them stuck.) Note that the chart is relatively simple: there are no 3D effects, no shadows or glowing shapes reminiscent of ET (The Extraterrestrial, not Professor Tufte! ), no color gradients or bevels or any of that chart junk. The text is simple, the colors are simple, and there are few extraneous lines. Posted: Thursday, March 6th, 2008 under Chart Types. Someone asked in the newsgroup how to create an XY chart in Excel that uses the label at the top of the columns of X and Y data for the axis titles. 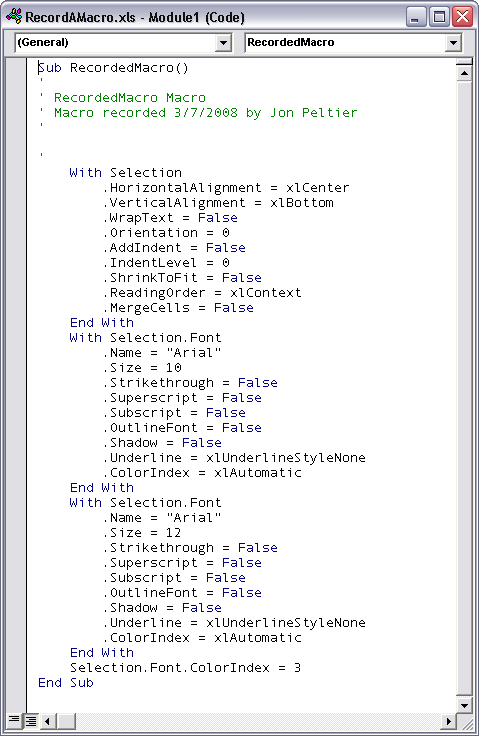 That’s not built in, but it’s not hard to do if you know a little VBA. I’ve taken an example from my web site, Interactive Chart Creation, and embellished it a bit. The VBA procedure (code below) actually works a bit like my first recollection of Excel charting, which had two dialogs, one asking for the data range, the other asking for the range of cells to cover witth the chart. Since I always align my charts with the cell boundaries, this is nicer than the Chart Wizard in Excel versions up to 2003 and the Insert Chart command in Excel 2007. The code uses a couple of input boxes to get the ranges from the user. I’ve added some smarts so it uses the selection as the default for the source data range in the first input box. If the selection is a single cell, the macro uses the cell’s current region (the contiguous range including the cell). 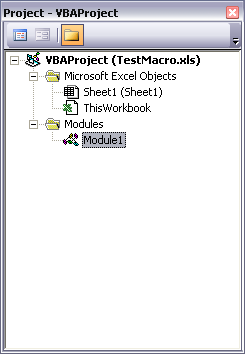 Copy the code below (use the plain text view of the code for copying) into a regular module in the VB Editor, then from Excel’s Tools menu, choose Macro, then Macros, or use the Alt+F8 shortcut key combination, then select and run the macro ChartWithAxisTitles. The first input box asks you to select the data range. Note that the active cell C9 has been expanded to its current region B2:D21 for the dialog’s default data range. The second input box asks you to select a region for the chart to cover. 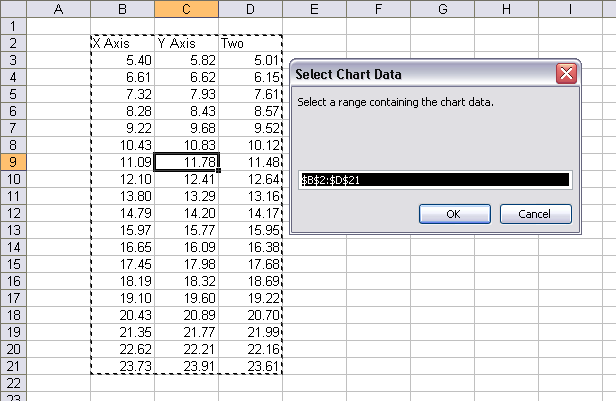 The result is an XY chart with default chart and series formatting. I’ve cleaned up the formatting slightly here, after the procedure inserted the chart, but obviously there’s room for improvement, particularly with the spacing of the chart elements. My data range had three columns. 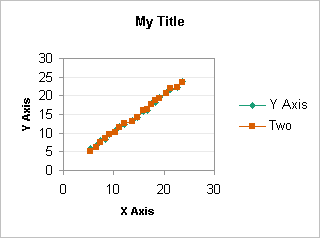 The first is used for X values and the X axis title, the others are used for Y values for two series. The cell above the first Y data column is used for the Y axis title, and the cell above each Y data column is used for the corresponding series name. 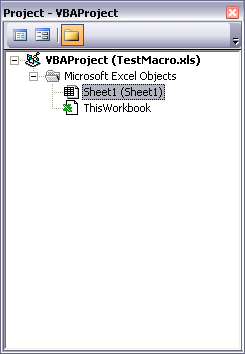 Posted: Thursday, March 6th, 2008 under VBA.